Your tour will begin with one of the most popular destinations of the world, the charming capital Athens. Explore its rich history by visiting some iconic landmarks like Panathenaic Stadium that holds the pride of the city. You can take a night tour to observe the floodlit splendour of the place. 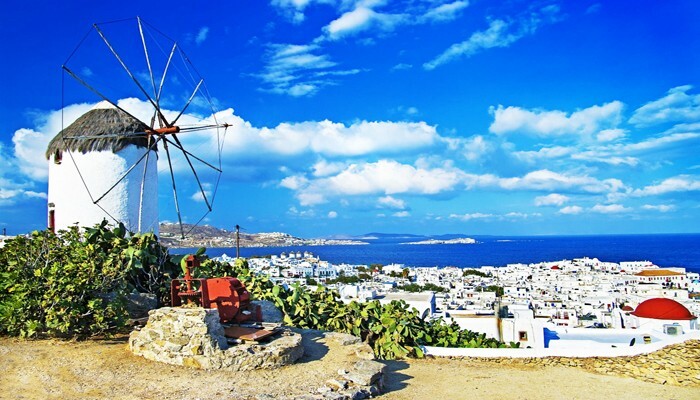 Thereafter you will be ferried to the two most famous islands - Mykonos and Santorini known for their majestic beauty. Enjoy a thrilling cruise ride across Caldera in Santorini that will take you to Nea Kameni Island harbouring an active volcano with a small hot water spring islet. Post which you will sail over underwater craters to reach Thirassia Island. Get a taste of its traditional lifestyle by visiting Manolas village located at the top of the cliff. Your exciting holiday would begin with your arrival at the Athens International Airport. 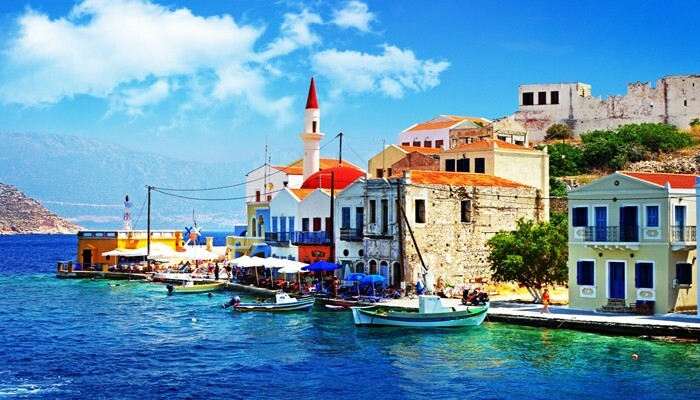 The enchanting capital of Greece, Athens has always been the birthplace of civilization. Upon arrival in Athens, meet the representative who would help you to reach the hotel. Check-in at the hotel and spend rest of the day at leisure. Take advantage of the free time by going on Athens by Night Tour to experience the floodlit splendor of Athens. See the city’s iconic landmarks illuminated in its full glory and enjoy an authentic Greek experience. At night, return to the hotel room for a relaxing overnight stay. Wake up to a beautiful morning and get ready to explore the classical and modern treasures, arts scene, and history of Athens by going on a city tour. Start it with a photo stop at the all-marble Panathenaic Stadium where the first modern Olympic Games took place in 1896. While roaming around the diverse city, pass by Prime Minister's residence (Ex Royal Palace) guarded by the Evzones in their colorful uniform. You would also pass by the Temple of Olympian Zeus, Hadrian's Arch, Parliament and memorial to the Unknown Soldier, Academy, University, National Library, Constitution Square (Syntagma). Thereafter, make way to the Plaka area to see the Acropolis museum. 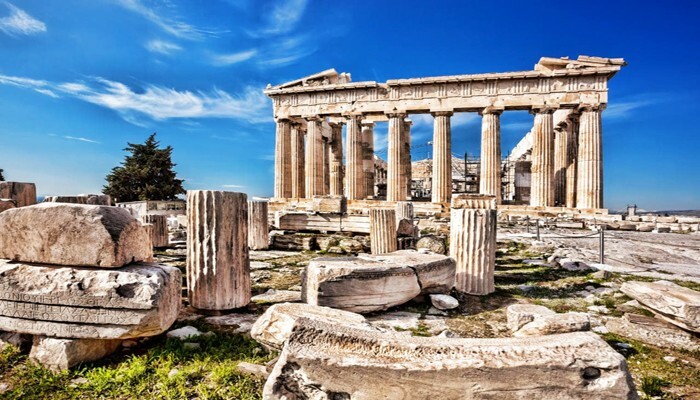 Explore the Architectural Masterpieces of Golden Age of Athens - Propylaea, Temple of Athena Nike, Erechtheion, and Parthenon. After the excursion, your rest of the day would be at leisure. Overnight stay at Athens hotel. Wake up to a beautiful morning and start your day with a delicious breakfast. Meet a representative at the hotel and get transferred to Port of Piraeus. Thereupon, board a ferry to reach Mykonos. Amidst the Aegean Sea, Mykonos, famously called 'the island of the winds', is the most popular and cosmopolitan island of the Cyclades. On arrival at the port, head to your place of stay; later spend rest of the day at leisure. Make most of the free time by learning about the lifestyle and history of Mykonos by enjoying a walking in the capital (Chora) of the island. In the evening, you could head for shopping or experience the dynamic nightlife of this beautiful island. At night, return to the hotel for a relaxing overnight stay. Enjoy a delicious breakfast and head out to explore the wonders of Mykono. Take walk on the cobbled streets and explore churches, behind the freshly painted shutters. Make way to the heavenly beaches and experience the liveliness of this place continue your tour to the Delos Island, a UNESCO World Heritage-listed island One of the most important mythological, historical and archaeological sites in Greece, Delos had a position as a holy sanctuary for a millennium before Olympian Greek Mythology made it the birthplace of Apollo and Artemis. At night, return to the hotel for a relaxing overnight stay. After starting your day with a delicious breakfast, you will be picked up from your hotel and get transferred to the Mykonos port for your ferry to Santorini Island. 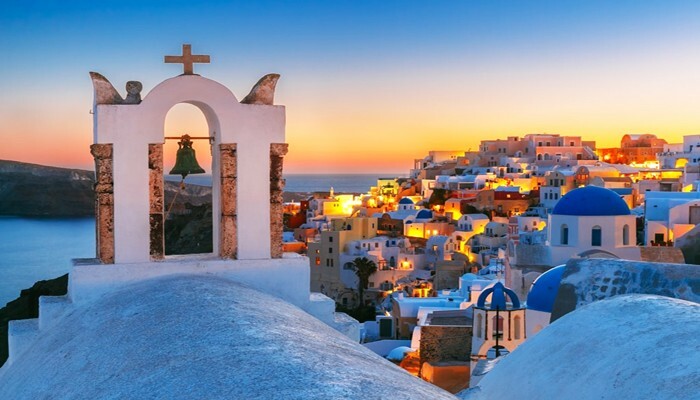 Rich in history, steeped in myth and offering a beautiful view of sunset coloring the sky in hues of blue red & gold, Santorini Island, a tiny Greek island, is simply magical. Once a thriving trade centre, Santorini is one of the most popular holiday destinations worldwide. Upon arrival in Santorini, get transferred to the hotel and spend rest of the day at leisure. Overnight stay at Santorini hotel. 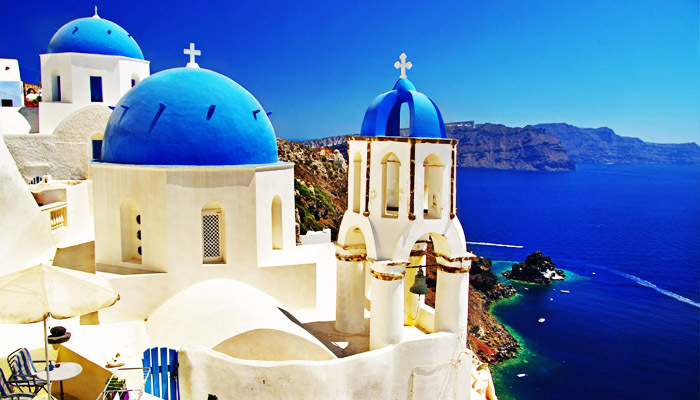 Enjoy delicious breakfast and embark on a half-day cruise across the caldera of Santorini. From the meeting point, board a bus going to the port of Athinios. Thereafter, board a cruise and set the sail to reach the Nea Kameni Island. Climb to the top of the volcano, see the active crater and walk on the soil path that approaches the active volcano. Thereafter, head to the volcanic islet of Palea Kameni. Feel the stress melting away as you take a dip in the hot spring created by the volcano’s underwater power. Sail above the underwater craters to reach Thirassia Island. Hop off the boat and treat your taste-buds to a delicious food in a small traditional tavern, swim in the crystal clear waters and visit the village of Manolas on the top of the cliff. On your way back, admire the beautiful landscapes in every direction and the charming seaside. Once you reach the port, hop in the bus and head back to the meeting point. At night, retire to the comfortable room for a relaxing overnight stay. After relishing a delicious breakfast, check-out from the hotel and get transferred to Santorini Airport for your onward journey via Athens Airport. You will arrive the Athens International Airport and further you will board your home bound flight. BALANCE INR PORTION WITHIN NEXT 45 DAYS & EURO PAYABLE 45 DAYS PRIOR TO DEPARTURE DATE. Tips @EUR3 per day per head. The hotels located on the islands (Mykonos/Santorini/Crete) do not have lifts. None of the hotels include lifts. There are no porters to help with the luggage either. This is not specific to hotels chosen by Discovery of India Trip but is the case with all hotels on the islands. Since Greece is an earthquake-prone country, the Greek government does not allow the installation of lifts. Please carry light luggage which is easy for you to carry up the steps. Rooms could be located around the house and customers will need to carry their own luggage. Please pack accordingly. 45 days or more before date of group departure = 30% of the Tour Cost. 45 – 30 days before date of group departure = 50% of the Tour Cost.